Artesyn single use valves feature a hybrid design that blends the traditional equipment format with single use disposability. 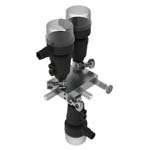 The mew Artesyn valves inlude a single use replacement to standard diaphragm valves, single use arterial process valves, arterial process modules as well as fully customizable configurations. Contact us at Leading Innovative Products and Solutions for these amazing, innovative process components. The Artesyn single use diphragm valves share common sizes with industry standard diaphragm valves allowing easy replacement. They can also be retrofitted with with pneumatically actuated control tops and electrical position indicators. 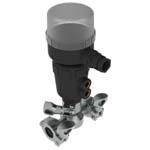 Designed as a drop in replacement for existing diaphragm valves, it has an easy to remove and replace flow through liner. Because of it's single use design, cleaning your diaphragm valves is unnecessary. The diaphragm valves share the same interior dimensions as standard US stainless steel tube sizes. 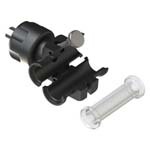 They will seamlessly fit into your existing process; simply unclamp and replace. With only one product contact component, the Artesyn Arterial Process Valve is perfect for single use or frequently changed process applications. 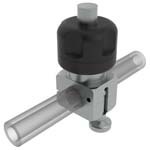 This arterial process valve, available in customizable configurations, allows you to easily and quickly change the single use process element. 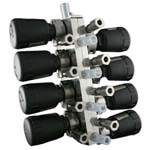 These valves are easily integrated into existing or new process installations. The single use process element is available in a variety of materials. 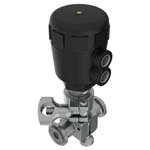 The valve also has many connection options, methods of operation and control configurations. Supplied as a full assembly with specially designed liners and mating tubing you can create the solution to your process requirements easily, quickly and at an affordable cost! All parts can be connected using ARTeSYN's clamp quick connection method! 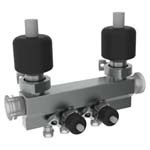 Clamp the ARTeSYN valve assembly straight into your existing tubing setup! Clamp the valve body around your tubing and then connect the method of operation to the body with another clamp and the valve assembly is ready for service. Marry ARTeSYN's ranges of Arterial Process Valves and liners into any existing system layout to find your process solution. 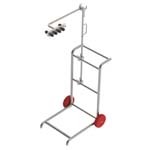 Whether you require tube over molding, specially designed connections, hose barbs or clamps. Aquasyn has the answer! The switches, either mechanical or inductive in design, are housed in a compact splash-proof enclosure. 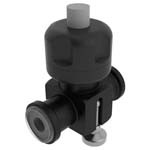 The position indicator can be rotated 360 and is easily fitted to the valve. The unit only needs to be screwed on and wired to be ready for operation. The side control positioner serves to position pneumatically actuated positioner valves. 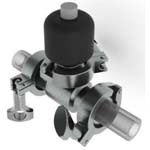 Side control finds applications in many areas by attachment to the process valve. The compact design of the aluminum body and the availability of versions for low air flow capacities enable attachment to positioning valves of small nominal diameter and size. The integral PID process controller may be activated to set up decentralized control. There are currently 3 standard liners available designed to suit a variety of applications and line media that can be molded into custom orientations to suit your layout. CUSTOM Liner material blends can be manufactured in conjunction with the customer and their specific requirements. The Artesyn Arterial Process Module allows the user to control complex processes like chromatography, or filtration, that are greatly improved with computer automation. Its single use design allows you to the flow path when finished. No cleaning validation requirements. No cross contamination concerns: simple and straightforward. 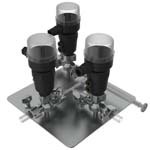 The Arterial Process Module is a next generation fluid management solution for single use process systems allowing you to modulate and control flow without having to use your fingers as the control valve. Enter the 21st century of automated disposable process systems with this unique, customizable modular solution. The modular offering enables you to minimize your hold up volumes even further, while you to automate and regulate the flow of your process. Then just throw away the fluid path. No mess or clean up. The Artesyn arterial process module takes our standard 2-way valves to the next level. It keeps all the benefits and features that set our 2-way design apart from the rest, but allowing the versatility that our customers require. 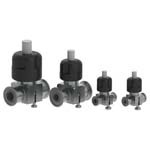 Available in limitless orientations and configurations with liners that have integral hygienic gasket ends or plain tube ends, there is no easier valve to assemble and service. The liner is easily removed and replaced for single use applications by removing the clamps that connect it to the next piece of process componentry. Cost effective platinum cured silicone liners as standard. Desire automation for your disposable process? Then this is the solution. Easily retrofitted with pneumatically actuated control tops and electrical position indicators. 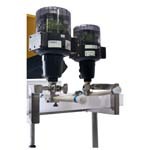 Now you can automate your single use process system or simplify the cleanup of your existing system with a dro in replacement for your fractional diaphragm valves. Manual and pneumatic actuation in a standardized configuration for custom flow paths can greatly reduce your hold up volumes and overall system cost. 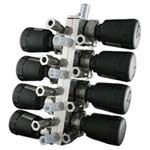 Artesyn arterial process valves can be arranged in a myriad of orientations. They can be arranged with individual straight through valves in combination for quick assembly and break down or in multi-valve arrays to facilitate even the lowest hold up volume requirements. Rather than try to use a product that was not intended specifically for your application, customize it yourself or let us customize it for you. Multiple material liners, with horizontal or vertical body partitions in stainless steel or other lighter weight alternatives are available.